VPI Industries HW-19 / HW19 owners manual, service manuals and schematics are for reference only and the Vinyl Engine bears no responsibility for errors or other inaccuracies. The PDF files are provided under strict licence. Reproduction without prior permission or for financial gain is strictly prohibited. This website is not affiliated with or sponsored by VPI Industries. Posted Fri, 02/12/2010 - 19:08 by yeoldestereo. The MKIV version of the VPI HW 19 series was the crowning achievement in this series. Borrowing heavily from their TNT series elevated the MKIV to lofty heights not thought possible in the HW 19 series. For improved bass, imaging, focus, detail, and lower noise, the answer is the Mk IV. The HW-19 Mk.IV turntable includes the same wood base, precision AC-Synchronous motor/pulley/belt drive assembly, and stainless steel-acrylic subchassis as the Mk. III. All this makes a great sounding turntable, but the Mk.IV goes further to become a Super Table. The Mk.IV borrows three critical parts from the state of the art TNT turntable: the platter, the bearing, and the suspension. The Mk.IV features the 1.5" thick, 20 pound, four layer, lead impregnated, precision machined, acrylic TNT platter. This platter has four times the inertia of the Mk.III platter and reduces noise, increases focus in the bass, and throws a soundstage far beyond the boundaries of your loudspeakers. This high inertia platter is mated to the noise reducing bearing of the TNT. By mounting the platter on a three-point suspension,and mechanically grounding it to the spindle, no random motion is allowed to enter the rotating system. The spindle itself is machined from stainless steel with sintered bronze bushings as the lateral wearing surface. The vertical thrust plate is virtually indestructible 92 Rockwell Tungsten Carbide. The platter and bearing assembly work as a unified team. They lower noise, increase low level detail, and provide a degree of focus that was previously only available with turntables costing a minimum of twice as much. All of this would be irrelevant if the turntable suspension was not up to the task. In the Mk.IV, we borrowed the suspension springs from the TNT and floated the entire assembly at 2.5 Hertz. The Mk.IV is very resistant to all forms of acoustic feedback and environmental noise. How good is the Mk.IV? The Mk.IV was ranked "Analog Source of the Year" by Stereophile magazine.. "A big thumbs up to Harry Weisfeld and his Mk.IV"... The Mk.IV's rewards greatly exceed its cost... congratulations..."
While the MKIV is not eye candy as compared to many other turntables and including those within the current VPI line up. With that being said, it is a wonderful example of industrial art and design at its finest execution. One look at the MKIV clearly gives one the impression, this is a serious turntable, capable of extraordinary performance levels. 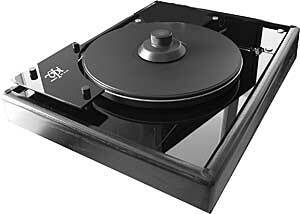 If by chance one is looking for reference caliber turntable, the VPI HW19 MKIV more than fits that requirement. Equip with the arm of your choice and a fine phono cartridge you will experience the analog medium as few will get the chance to hear. In the prewoned market these usually sell for about $1,200.00 and at that price it may come with a tonearm, if so that just adds to bargain. Try to find one that has the original box and internal packing pieces. This is a heavy table at about 50 pounds, so packing and shipping is a high priority, so it arrives alive. Also due to its weight will need a rock solid resting place. VPI makes a turntable stand and is highly recommended for this table. One will have to dig very deeply into their resources to find a turntable of this caliber to exceed the the lofty performance standards of the HW 19 MKIV. Plus VPI remains in business today and help and advice of any of their products is a phone call away and yes they do answer the phone. One of the great U.S. based and built audio components that has stood the test of time and continues to deliver the promise of high end analog playback. Plus one can add the stand alone motor assembly aka SAMA as well as the SDS. The SDS allows for the adjustment of both the voltage and frequency fed to the turntable motor. Instead of merely filtering the power line, the SDS first changes it into pure DC voltage and then digitally regenerates its own clean signal. This approach is superior to that used in many of the other power line conditioners on the market. After 50 years in this hobby/business I can easily recommend the VPI HW19 MKIV turntable, for those needing a turntable of impeccable quality and build. It just doesn't get much better than this. Posted Fri, 02/12/2010 - 19:04 by yeoldestereo. While the 19 series of tables from VPI were their entry lineup of tables, nothing was spared in their constuction, which is very robust indeed. The common thread in the VPI tables is superior execution of the most basic principles of turntable physics,geometry, and construction. Using way above average motor,bearings and spindles. It seems to me that far to many turntables of today,have forgotton the basic premise in turntable design. The VPI HW 19 is totally built with all those parameters in mind and does not stray from that philosophy. Lets be totally candid here physics and geometry are a pure science of which there is zero variation, therefore it is basic law. Once a turntable manufacturer understands this, then the design of the turntable can be set. But here is where things for some begin to fall apart. Some sacrifice basic law for cosmetic beauty or sound principles or marketing becomes its own mandate for the sale of product. The VPI 19 series of tables will never win a cosmetic beauty contest with other product. But that was not the design goal of VPI for the 19 series. Thankfully this line from VPI concentrated on the fundamentals and has remained true through the entire 19 line up up to the MKIV edition. Only making improvements as time and materials dictated a change for improved sonics. It was never changed, just for the sake of change or marketing. The VPI HW 19 will accomodate just about any tone arm, in fact I don't know of any tone arm that cannot be mated to this line up. With the excellent support from VPI for not only their current line up, but for past product as well, will keep the venerable HW 19 current for years to come. The staff at VPI is excellent and are more than ready to help with any concerns. This is not often found today and is most refreshing to say the least. If it is a VPI product, they are ready, willing and able to help. Great folks to do business with. The VPI PLC that came with the unit is a Micro Processor that controls fluctations in line frequency. Most likely no one has a true 60Hz from the wall outlet. It can vary and with the PLC you can dial in the correct wall outlet frequency. Over all the PLC makes a great difference on the overall sonics of the VPI HW 19. Lately there has been a lot of press on turntable micro processor or now known as speed box from some manufacturers. I can attest to the fact that these items do make a positive sonic improvement by getting platter rotation spot on. VPI now has an improved unit known as the SDS and is an improvement over the PLC. If the new SDS is anything like the PLC it is more than a worthwhile investment and is highly recommended. Anyone Own Any Pocket Discs?